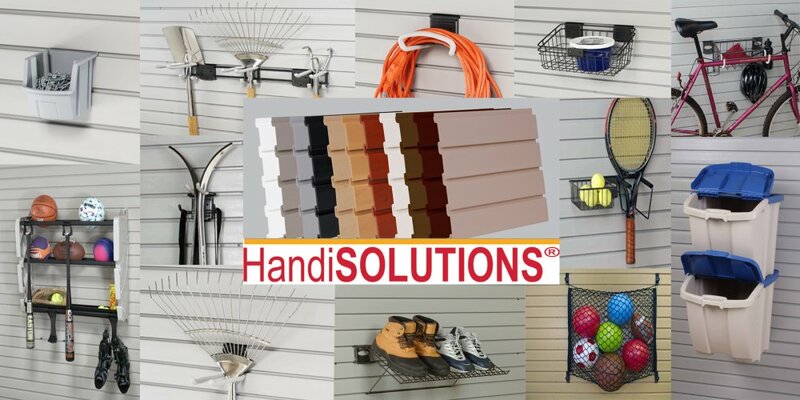 HandiWall is the cellular PVC slatwall designed to store and organize your garage or any area storewall is needed. Residential, Retail, or Commercial uses. You can cover your entire wall, or use this product to cover a small section. Made from a strong thick PVC Plastic Material it won't rust, or rot and is water proof. 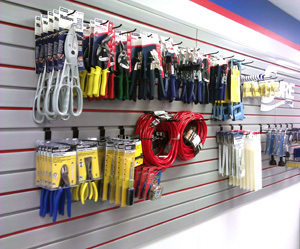 We have all the HOOKS, BASKET BINS AND SHELVES and TOOL AND SPORTS STORAGE products to help you get orginized. The HandiWall Panels work great in the garage, craft room, work station, office, retail stores and more. 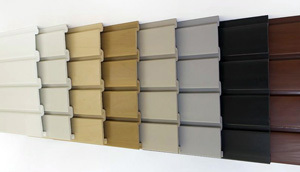 HandiWall Color Strips for Slats, 96"
HandiWALL® is the cellular PVC slatwall base which can be directly installed in full 8’ or 4’ panels. The panels can also be cut to size to fit tighter storage spaces. The SlatWall Panels are made from durable PVC, and will last for years. Use from floor to ceiling or just a small area to organize your tools. The SlatWall is versatile where you can move your hooks and baskets easily when your storage needs change. It is impervious to water and the unique profile prevents water from pooling in the slats. Home: Organization within the home has become its own market. Adding custom organizers within the home increases its value, not to mention just making life easier. Using HandiSOLUTIONS® to create storage space in the basement, organize crafts and wrapping paper, or free up counter space in the laundry room are a few ways to get more living space in your home. Clear cramped entryways by creating a clutter-free mudroom equipped with shelves, hooks and bins for those backpacks, coats and shoes. Retail Display: HandiSOLUTIONS® offers the HandiWALL®as a durable, beautiful canvas to help create your retail display space. Merchandising is a snap to execute with the wide variety of hooks, shelves and bins. Any configuration you can imagine is possible. The commercial HandiWALL® is flexible, modular, and easily changeable.